Joseph A. Sullivan, B.A., LL. B. We are saddened by the death of our Chairman, colleague, and friend Joseph A. Sullivan on August 02, 2002 in New York City. William J. McGurn of The Wall Street Journal, August 9, 2002, wrote a poignant and apt characterization in his editorial that deserves wider recognition. 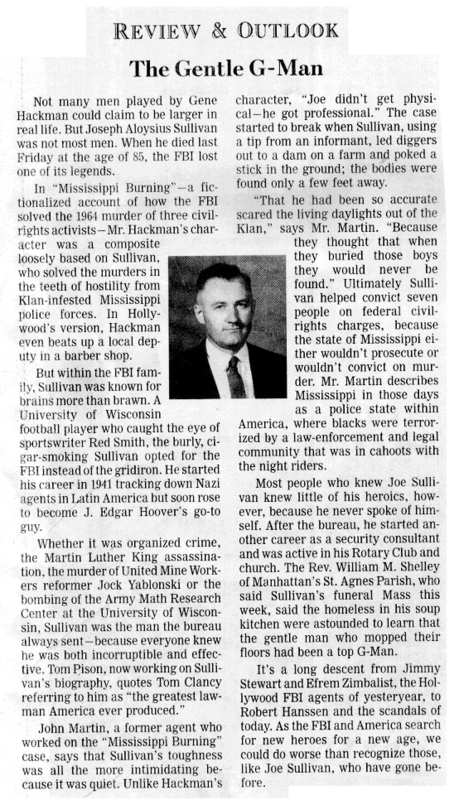 Joseph Aloysius Sullivan, Chairman of the Board of Directors for the World Training Institute was also for many years a Security Consultant, Special Agent and Major Case Inspector for the Federal Bureau of Investigation. The World Training Institute that Sullivan established had been accredited by the state accounting boards of New York and New Jersey to provide low-cost Continuing Professional Education programs to auditors and accountants in other not for profit organizations.